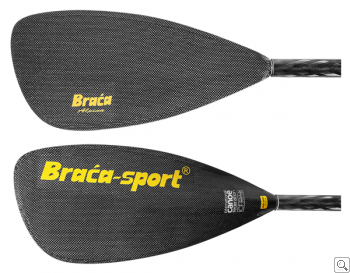 Brača Alpina is the latest Down River paddle model designed for use in extreme conditions where stability and maneuverability is essential. The blade moves smoothly through the water with minimal sideways slip, giving maximum steering control. The edge of the blade is reinforced with a special Kevlar yarn all around, which makes it highly impact resistant. The CNC machined special foam core gives it extra strength to withstand strong forces from all directions. It meets all ICF rules and regulations. * We recommend stiffer shafts for bigger blades and stronger athletes.